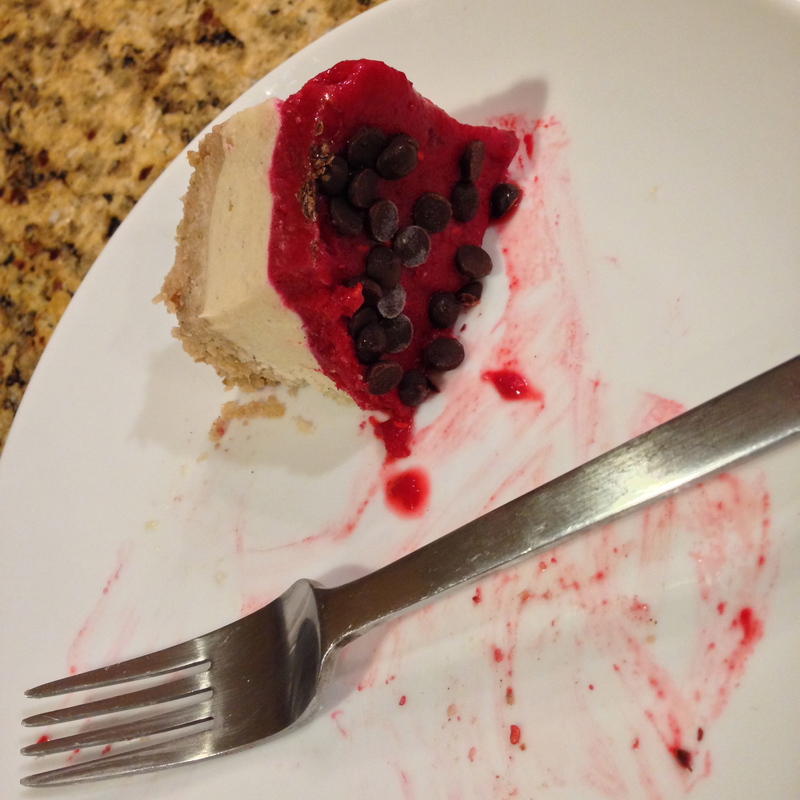 I have to admit I don’t like cheesecake. At all. Ever. Which is fine because it doesn’t really like me either. At least not my gut. There’s definitely no love lost in their relationship but I do have to say I LOVE this cheesecake. Which is awesome because it actually loves me too. It told me so in the way it didn’t have me writhing in pain or running to the loo or clearing out a room in 10 seconds flat. 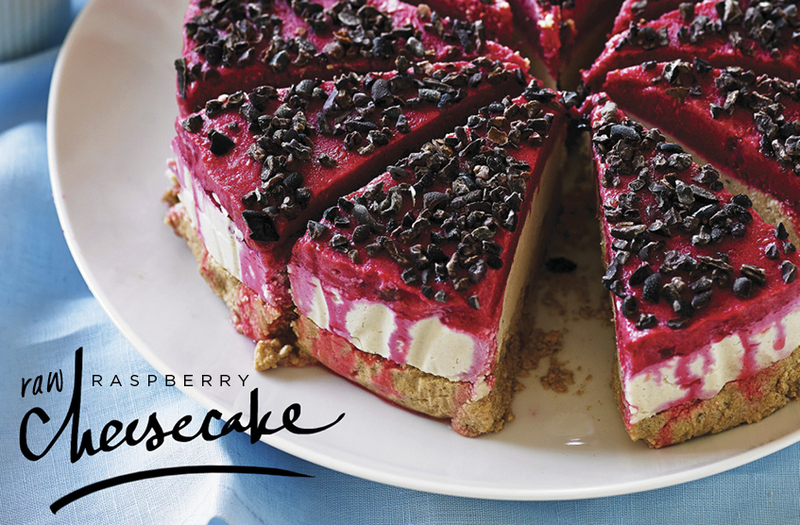 So I repeat, I LOVE this cheesecake and now you can too. Trust me, you will…especially when you see how easy it is to make! Full recipe is below but here’s the jest of it. 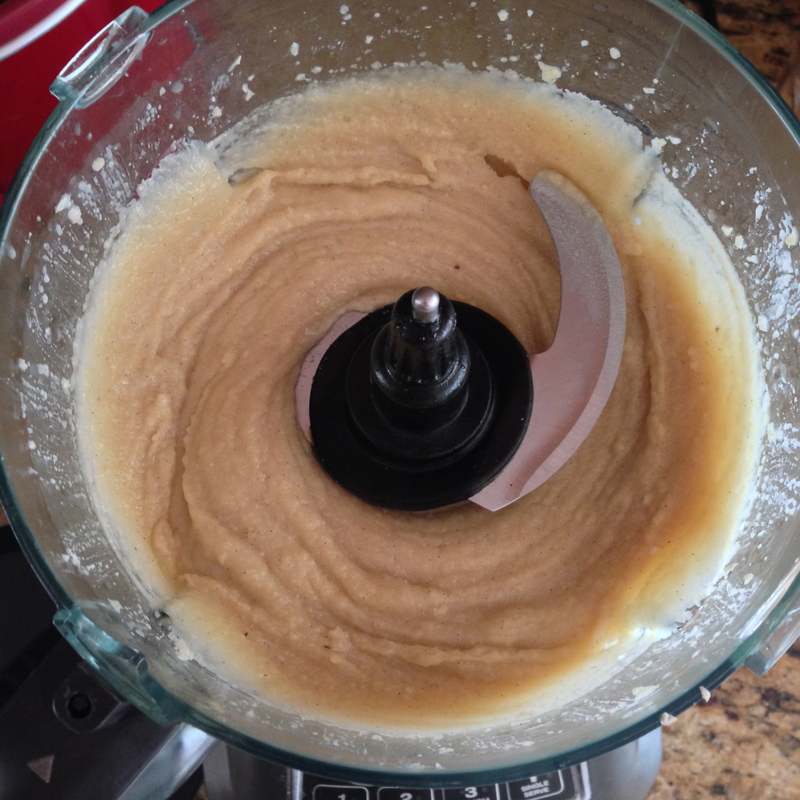 Blend in the food processor until they look like this. Place it in your dish and press firmly. This is your crust. 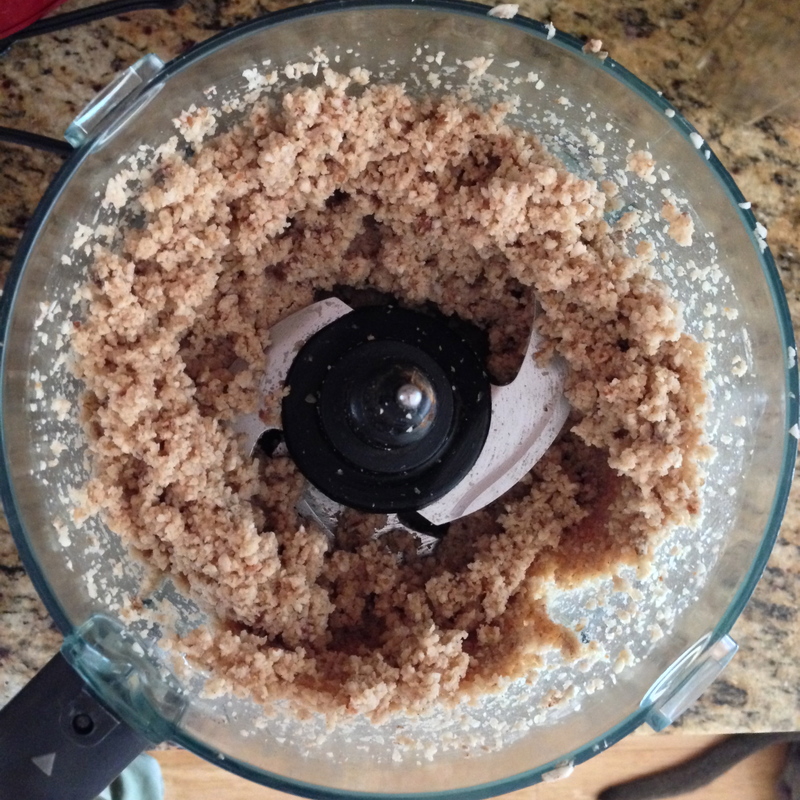 Blend in the food processor until it looks like this. Pour on top of the crust and smooth with the back of a spoon. 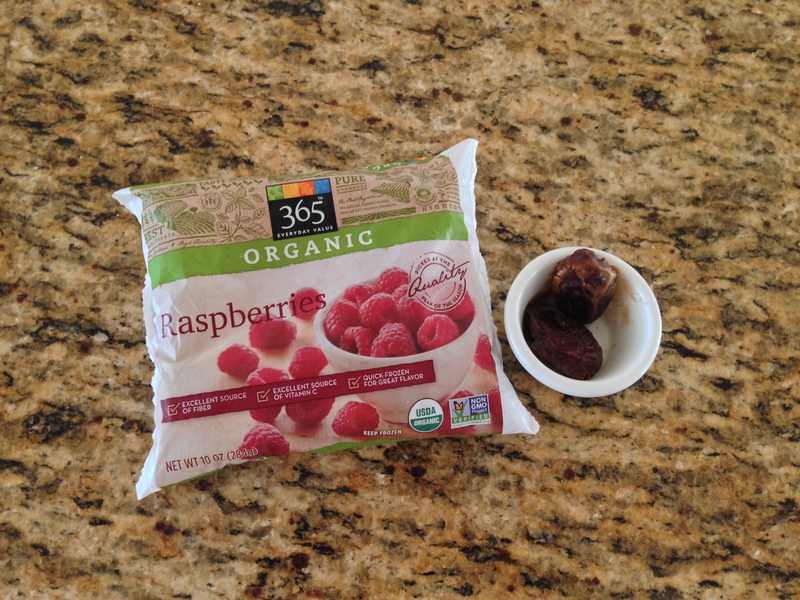 Then take your frozen raspberries and remaining dates and blend. Pour on top of your last layer and smooth to look like this. This tastes nothing like real cheesecake. Anyone expecting it to will be in for a disappointing shock due to unfair comparison. This does however tastes like a super yummy, light-yet-incredibly-filling pie tart that despite being dairy-free will blow your mind without blowing out your gut. If you have people in your life that refuse to try any ‘faux cheese’ (ie. 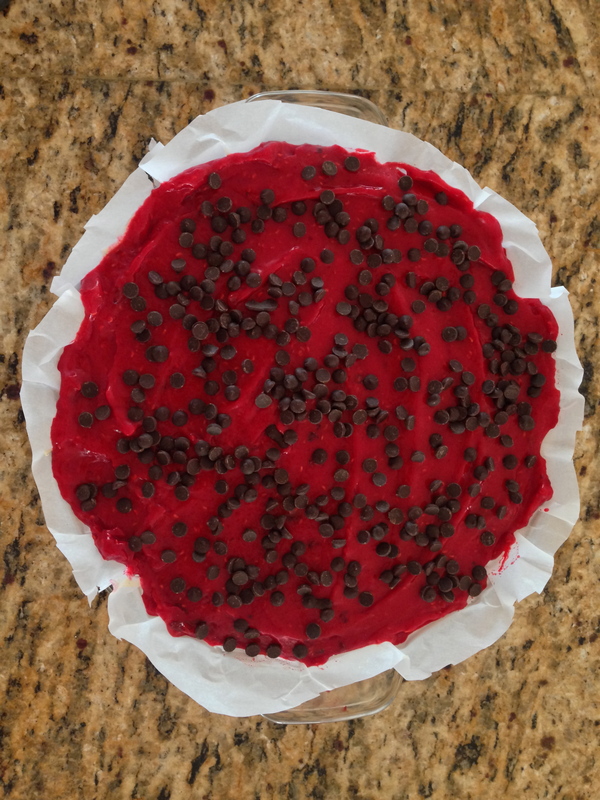 My Husband) I recommend presenting it as a tart or protein packed pie. Otherwise you run the risk of them complaining, saying its ‘ok but definitely NOT cheesecake’ and that’s if you can even get them to try a slice to begin with. This isn’t an all-day process or painfully difficult by any means but it does take some time. Not that blending things takes forever but constantly cleaning the food processor for each layer does. Then of course theres the time needed for it to set and then to thaw a bit (10-20 mins depending on how long it was freezing). Meaning, if you want it for Friday night make it that morning or even the night before. When using frozen fruit and adding the water to the blending process, keep in mind that the more water you use, the more ‘icy’ the flavor once it is finally served. If using over a cup over water, remember that once its barely thawed it will have a flavor-ice consistency. This then turns even runnier once completely thawed. You want it a little drippy but not watery. Some people care about the consistency of the drip….some people don’t. It’s really just personal preference but definitely worth noting when it comes to adding water. Just because it’s Raw and Vegan doesn’t mean that it’s fat & calorie free. One healthy-sized slice of this thing will set you back approximately 390 calories, 28 grams of fat (only 10 is saturated though), 9 grams of protein and 10 grams of sugar. However, that’s a damn site better than the 1200+ calories and 68+ grams of fat from a slice of cheesecake from the Cheesecake Factory! 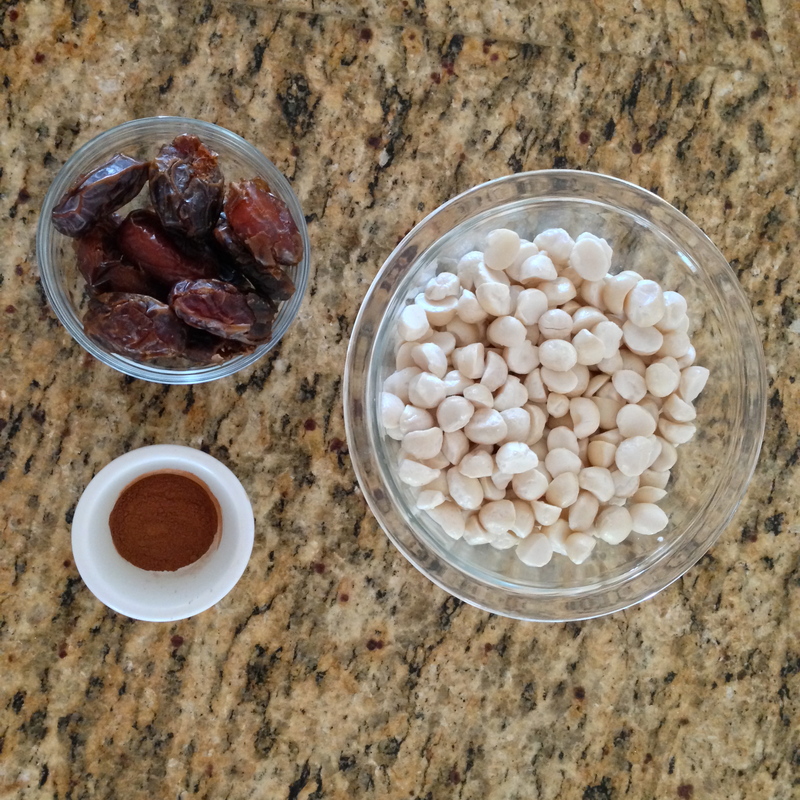 Besides, real food has calories and fat which are often low and your body knows how to process them productively. Fake food has chemicals instead; of which your body doesn’t know how to process and are often toxic anyway. So if you ask me, I’d rather take 400 calories of fruit and nuts that fuel my body than 15 calories that sit in my gut and just gets stored as toxic fat any day. The best part of this recipe is that you can customize the texture and taste of the crust with all sorts of different nuts. You can use walnuts, pistachios, pecans…..whatever! It doesn’t stop there…Want to make it chocolate? 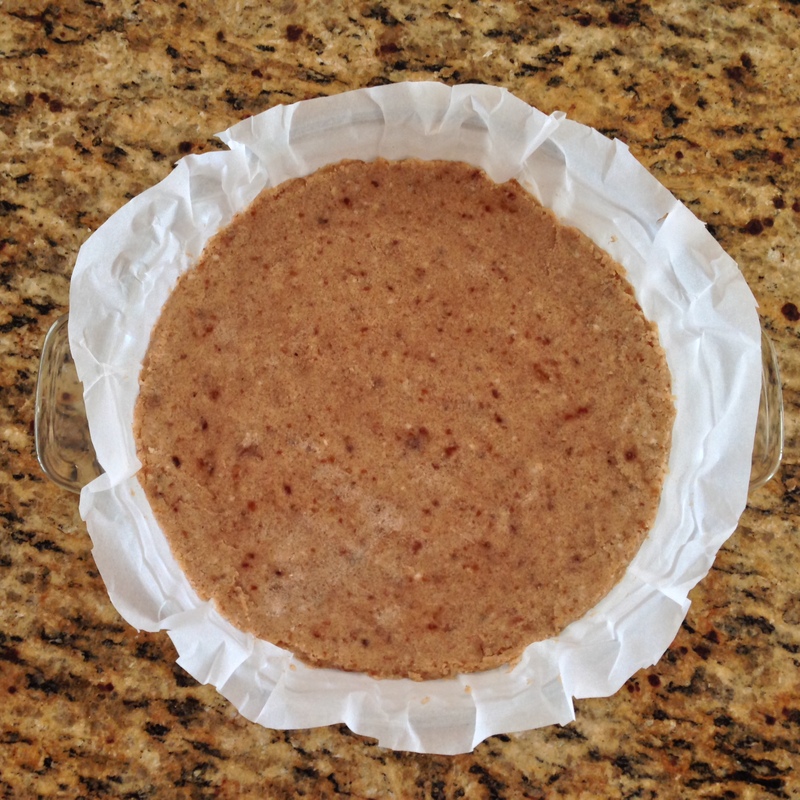 Add ¼ c of raw cacao to the filling mixture or even the crust! Add fruit or mint to that as well and really blow your own mind. Wanna Mix up the topping? 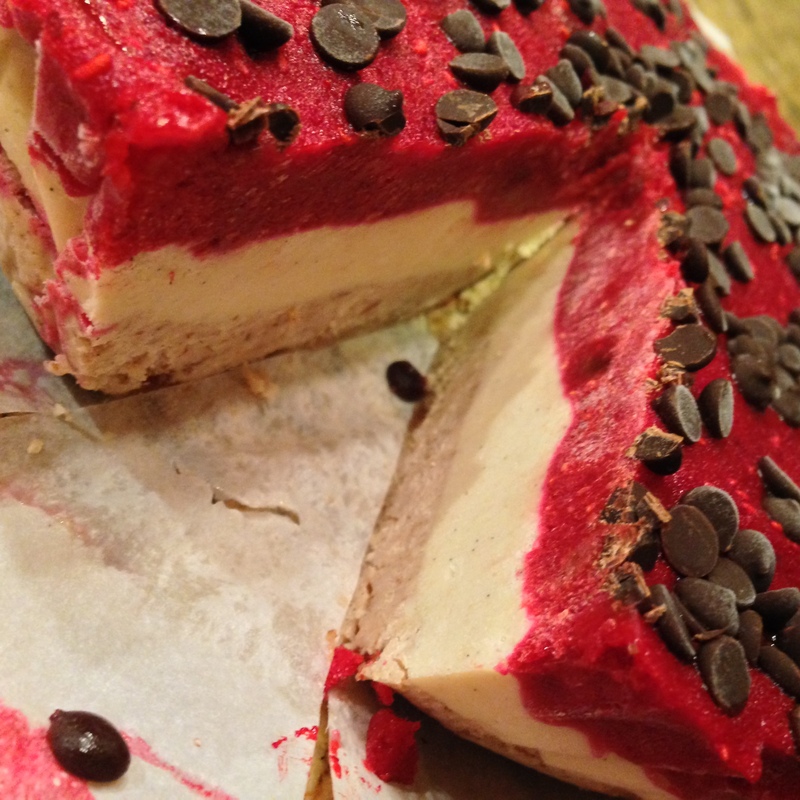 Use frozen mangos instead of raspberries! Since the filling and layers are completely customizable, consider this a baseline dessert recipe that can be adapted with just a few simple swaps! Now go Raw Wild and Get your Nut On! Using an 8in spring-form pan for your mold, pour the crust mixture in to the pan and press firmly to flatten it as much as you can. If you’re like me and do not have a spring-form pan or just want to present this like a beautiful tart in a dish, use parchment paper to line the inside of your dish, making sure that your edges are covered as well. 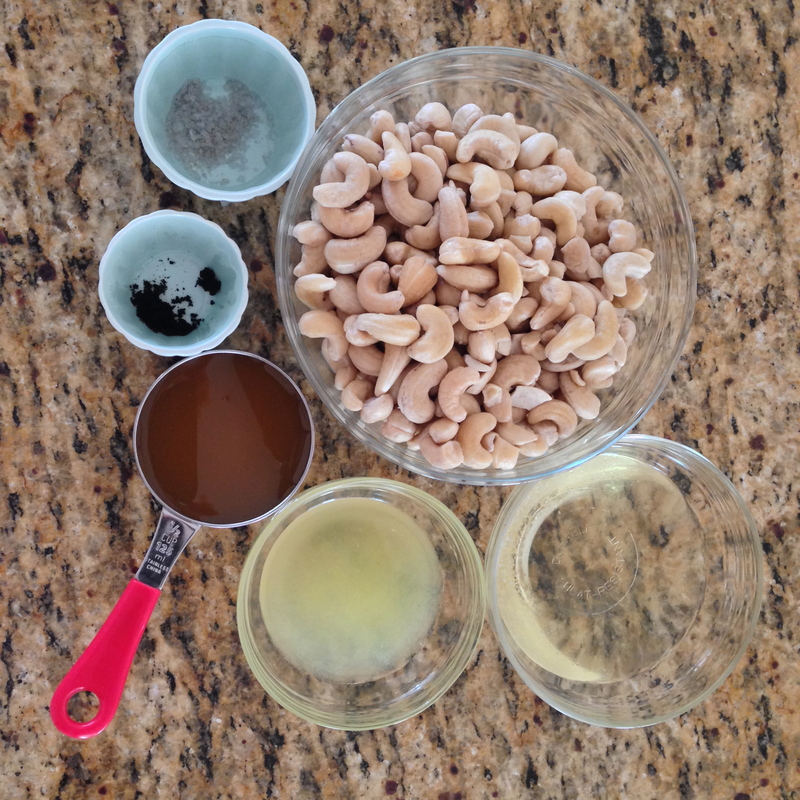 Pour the crust mixture into the pan and press firmly as if using a spring-form mold. Place the tin/dish into the fridge to chill and firm. 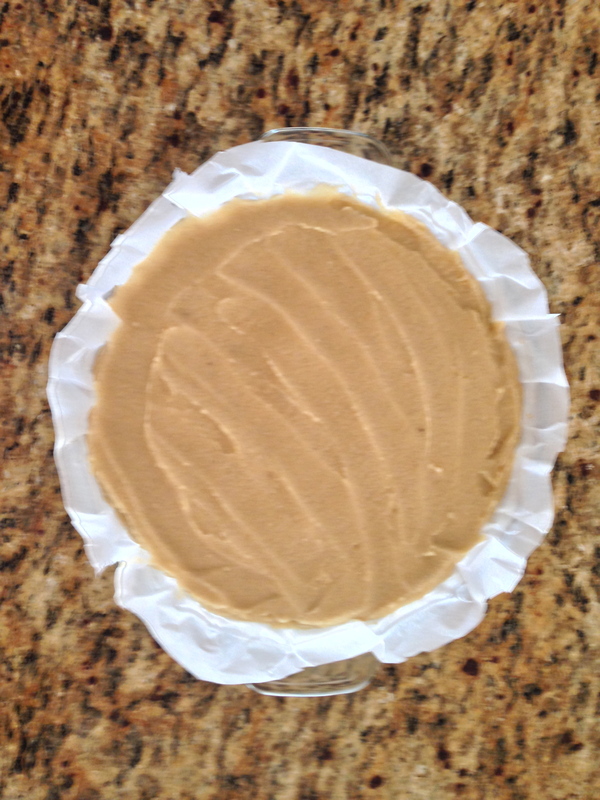 Take out your tin/dish and pour in the ‘cheesecake’ filling on top of your crust. To even out the surface, you can either tap the sides a bit to shake it down or use a spatula and smooth across the top. Then pop this layered piece back into the fridge to chill. Finally we’re on to the raspberry layer. Put your now-slightly-thawed raspberries and the 2 remaining dates into your food processor and blend until smooth. You may need to add a little bit of water until it’s the texture you want. Pour this mixture onto you ‘cheesecake’ layer and smooth it out with a spatula. Then sprinkle on the cacao nibs! Place the whole delicious thing into the freezer to sit for at least 4 hours or overnight. Remember to keep it as level as possible! 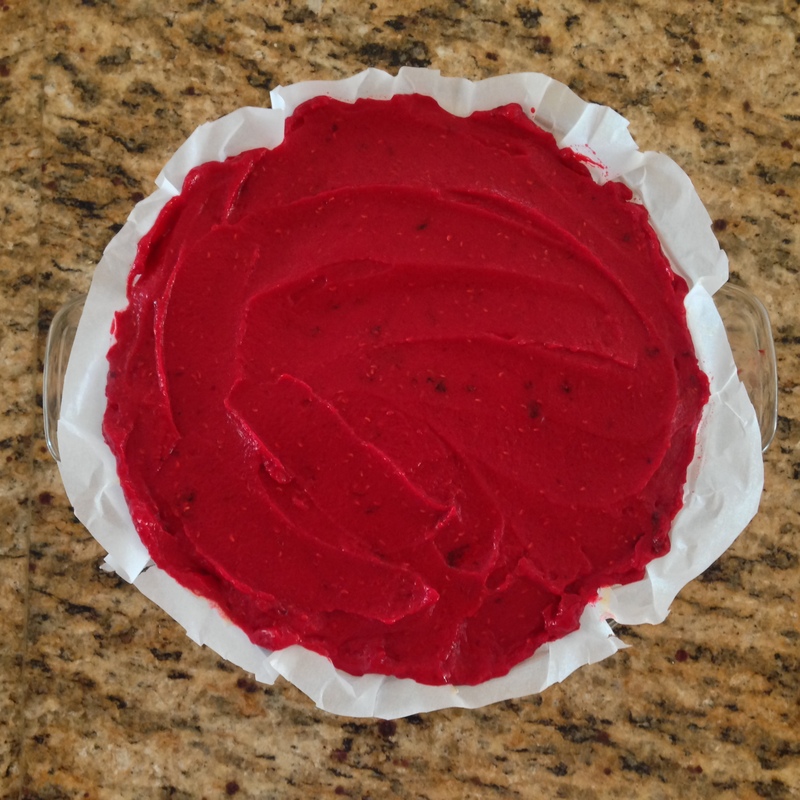 When you’re ready to serve, take it out long enough beforehand to let it thaw a LITTLE bit so it’s easier to cut and the yummy raspberry topping gets that awesome drippy texture. Slice, serve and enjoy! Next post Savory Mac & Cheese Cupcakes, Please!